With Amazon Alexa, developers are creating novel and delightful voice experiences for customers. University students are rethinking the way we live. Meet Adam Betemedhin, an Electrical Engineering major, and Kevin Duong-Tran, a Computer Science major, from the University of Nevada, Las Vegas (UNLV). 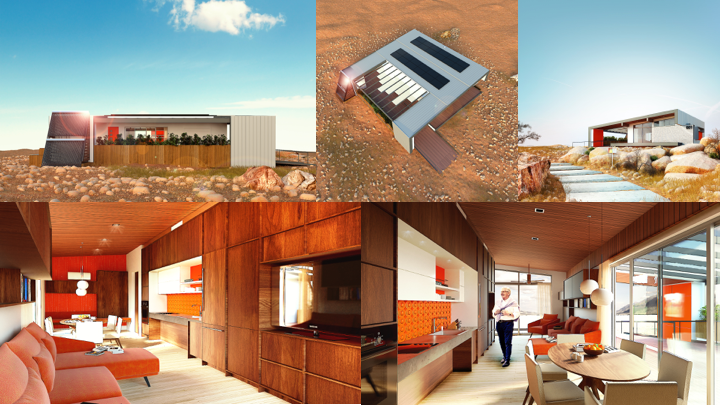 Adam and Kevin, along with roughly 20 other students from multi-disciplinary backgrounds at UNLV, are participating in the 2017 Solar Decathlon, a competition sponsored by the U.S. Department of Energy that will culminate in October of this year. Their challenge: design, build, and operate a solar-powered house that is cost-effective, energy-efficient, and attractive. Specifically, the team has chosen to design a net-zero-energy smart home that addresses the unique functional needs of those who are aging in place. Based on learnings from a previous UNLV entry submitted in 2013, Adam and Kevin quickly realized that an important characteristic missing in their homes, especially for those aging in place, is how the home interacts with its users, or habitants. “We felt like the interfaces in our previous home were not user-friendly, and the device integration was limited by what was available in the market at the time” says Adam, “having access to a wider range of smart integrations inside of the home would make it much easier for individuals aging in place to take advantage of new technologies on the market”. Using Amazon Web Services (AWS) and Amazon Alexa, the team is determined to create integrations that make it easier for users to operate and understand their home. In addition to smart home devices, the team will be outfitting their home with a number of devices to monitor its performance, including environmental sensors for temperature and humidity and usage sensors for occupancy and power consumption. As the home generates data every day, the team will use AWS to ingest, store, and analyze the performance of the home, which will help it to become ‘smarter’ over time. “AWS was an attractive option for our solution because of the high-availability of its services and their easy integration with one another,” says Kevin. Thanks to the support of the AWS Cloud Credits for Research team, the team also hopes to publish their findings publicly so others in the industry can learn from their work. Adam and Kevin also recognized that Alexa and the Alexa devices would provide an intuitive way to tie all of the technology in the home together to keep the habitant informed, improving both the technical interface with the home and more importantly, the overall living experience. “Using Amazon Alexa was more about the ability for users to interact with their technology in a very natural form. Alexa simplifies the operation of smart homes and enhances the user experience by allowing users to use smart home technology through voice-control,” Adam explains. I invite you to follow the UNLV team’s progress and plans as they build the smart and efficient home for future generations to come. Wish them luck! Earlier this year, we announced echosim.io by iQuarius Media, a browser-based interface to Alexa, to allow developers who are working with the Alexa Skills Kit (ASK) to test skills in development. We announced the Amazon Alexa Prize, a $2.5 million competition to advance conversational AI. In November, we announced the first ever Amazon Alexa Hack the Dorm contest and throughout the year, we’ve taught thousands of students at developer events and hackathons how to build Alexa Skills. If you are as energized as we are about this shift in technology, get started today. As we often say at Amazon, it’s always Day 1 and there is so much more to do. The Smart Home Skill API is a new addition to the ASK that enables developers to add capabilities, or skills, to Alexa. Amazon Web Services (AWS) delivers a set of services that together form a reliable, scalable, and inexpensive computing platform in the cloud.